On Saturday and Sunday, April 18 and 19, 2015, Raquel will be exhibiting at the LA Festival of Books in booth NUMBER? 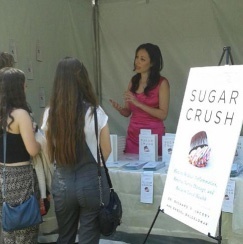 She will be available for interviews and will be selling her brand new book from Harper Wave (a division of Harper Collins), Sugar Crush: How to Reduce Inflammation, Reverse Nerve Damage, and Reclaim Good Health. Find out why everyone who eats in America needs to read this book! We are all addicted to sugar, but most of us do not realize just how much sugar we’re eating. Fat does not make you fat. Healthy fats are necessary to lasting health. Sugar is responsible for skyrocketing chronic disease, including diabetes, gall bladder disease, multiple sclerosis, heart disease, autism, and Alzheimer’s. Sugar is damaging our nerves and killing us slowly over time. Visit Raquel at the LA Festival of the Books and be one of the first people to receive a copy of this important book that can save your life!